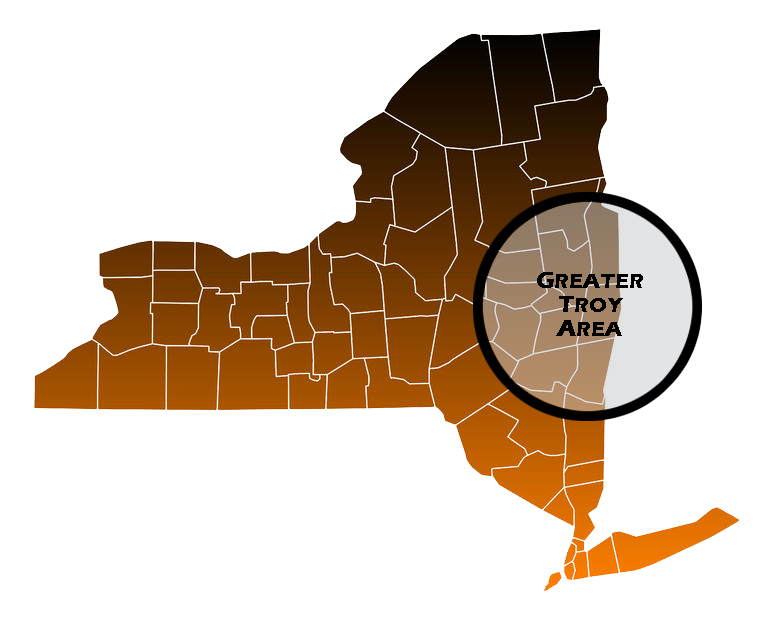 Troy is the final piece of the three-part puzzle that makes up the Capital District, along with Albany and Schenectady. On the eastern edge of the Hudson River, Troy is best known as the location of RPI - the Rensselaer Polytechnic Institute - which is the oldest private university for engineering in the country. Troy has historically been a very wealthy community and reflects this with some of the majestic Victorian architecture you can find scattered throughout this city of over 50,000 people. There is plenty of transportation in and around the Troy area, with easy access to the Amtrak train, Greyhound bus terminal and local transportation managed by the Capital District Transit Authority. You don't need to own a car to get around in Troy, but if you choose to drive, finding Troy auto insurance can sometimes be a hassle. To avoid the headaches, you can visit Capital Gate Insurance Group for a free Troy car insurance quote. We've already sought out the best local Troy auto insurance brokers for you, so all you have to do is choose the one that best suits your needs. Troy has a number of great parks to enjoy, including Knickerbocker Park & Ice Arena and Prospect Park. You can see concerts and sporting events at the RPI Fieldhouse, try a few holes at Frear Park Municipal Golf Course or go fishing at Tomhannock Reservoir. If your preferred outdoor recreation is vehicle-based, make sure to find out local regulations before you take out your ATV, boat, motorcycle, snowmobile or RV. While they are permitted, be sure you don't use them unless you are properly insured. For Troy boat insurance or insurance for other recreational vehicles, get in touch with Capital Gate Insurance Group. We can find Troy motorcycle insurance, boat insurance or ATV insurance as easily as we do for your car. Many people find living in Troy to be a delightful experience. In addition to the beautiful architecture and lush parks, the city of Troy often puts on special events for its residents, including the annual arts and music extravaganza known as the River Street Festival, the Troy Flag Day Parade and the Troy Pig Out, a summer BBQ contest. Many Troy residents also enjoy peace of mind from knowing that their homes are protected by quality insurance. They often find their insurance through Capital Gate Insurance Group. We can help you find a Troy homeowners insurance quote now for free. And if you're looking for Troy home insurance as a renter, we have found plenty of Troy renter's insurance policies as well. And because real peace of mind comes with knowing your family is protected, we can also offer you a quote on Troy life insurance. The Troy economy has traditionally been based on textiles and clothing, but as industrial decline has done its work, the city - like others in the same situation - has been moving into technology, especially video games. Architecture is also a popular industry in Troy. If you're looking to start a Troy business, don't forget to contact Capital Gate for the best Troy commercial insurance.